The blue-eared barbet (Psilopogon cyanotis) belongs to the family of Asian barbets, the Megalaimidae. The blue-eared barbet species is distributed in India, Nepal, Bhutan, Bangladesh, Myanmar, Thailand, Cambodia, Laos, Vietnam and China. These barbet species are treated as conspecific with P. duvaucelii and P. australis by some authors. These barbets are polytypic species. The blue-eared barbet (Psilopogon cyanotis) is a comparatively small barbet, measuring 15 to 17 cm in length and weighing about 40 gram. The blue-eared barbet has green upperparts. The underparts are yellowish green. The male has blue ear-coverts, mid-crown and throat. There are red patches above and below the blue ear-coverts. There is an orange cheek patch. The forehead is black. There is a narrow diffuse black band between the throat and the breast. The undertail is pale and bluish. The female has duller color pattern. The juvenile had overall green plumage with bluish wash to the face and throat. The bill of the blue-eared barbet is stout and dark and is fringed by bristles. The irises are dark brown. The feet are dark gray. Their call is a disyllabic, repetitive "tk-trrt..tk-trrt..tk-trrt" sound. The blue-eared barbet species is distributed in India, Nepal, Bhutan, Bangladesh, Myanmar, Thailand, Cambodia, Laos, Vietnam and China. In India, these species are distributed in the states of West Bengal, Sikkim, Assam, Meghalaya, Arunachal Pradesh, Nagaland, Manipur, Tripura and Mizoram. 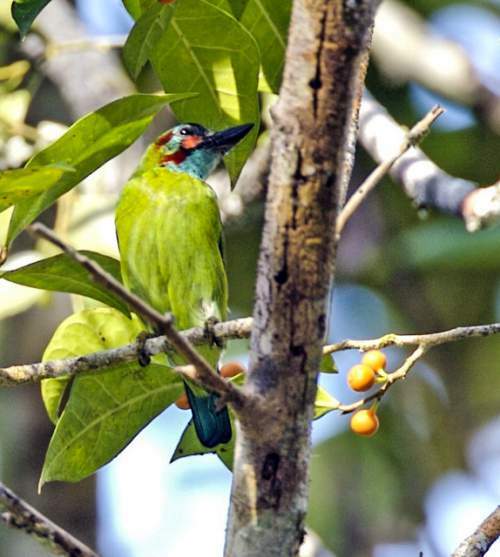 The blue-eared barbet nominate subspecies P. c. cyanotis is distributed in southeast Nepal, Bhutan, eastern Bangladesh, northeast India, Myanmar, Thailand and southern China. The barbet subspecies P. c. orientalis is distributed in eastern Thailand, Cambodia, Laos and Vietnam. The subspecies P. c. stuarti is distributed in peninsular Thailand. These blue-eared barbet species have moderate forest dependence. They normally occur in altitudes from 0 to 1600 meters. The artificial ecosystems and habitats of these species include, plantations, orchards and rural gardens. The natural ecosystems and habitats of these species include, tropical and subtropical moist lowland forests, tropical and subtropical moist montane forests, broadleaf evergreen forests, mangroves and tropical and subtropical moist shrublands. The diet of this blue-eared barbet consists mainly of fruits. Wild fruits, orchard fruits, berries, figs, drupes and insects are their primary food. 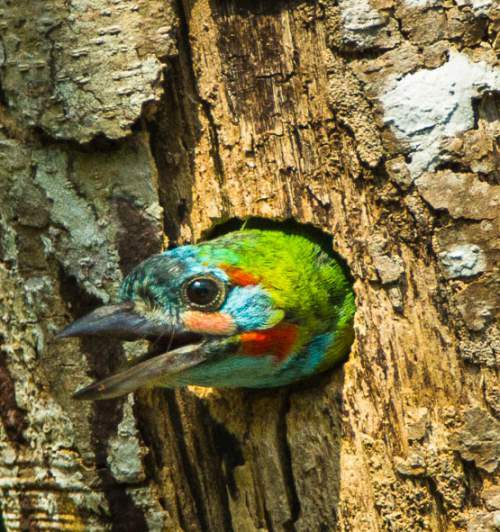 These barbets are mostly arboreal and forage in mid-storey and canopy. The breeding season of these blue-eared barbet species is from January to August in most of their range. In Vietnam, laying is observed in January. In Thailand the breeding season is from March to September. The nesting sites of these species are hollows in tree trunks, excavated by the breeding pair. These species are monogamous and territorial. The clutch usually contains two white eggs. The nestlings are fed by the parents. These blue-eared barbet species are non-migrant resident birds. The populations living in the higher altitudes descent to lower levels during winter. Post breeding, the juveniles may disperse and establish in new locations within the range. Within their range, they may make local movements for feeding and breeding. The global population size of the blue-eared barbet (Psilopogon cyanotis) has not been quantified. The overall population trend of the species is considered to be stable. In most of its range, this barbet species is reported to be common to locally very common. The generation length is 8.5 years. Its distribution size is about 3,270,000 sq.km. Habitat alteration and destruction, fragmentation of the habitats, hunting and trapping for pet-trade are the main threats that are endangering the survival of barbet species. 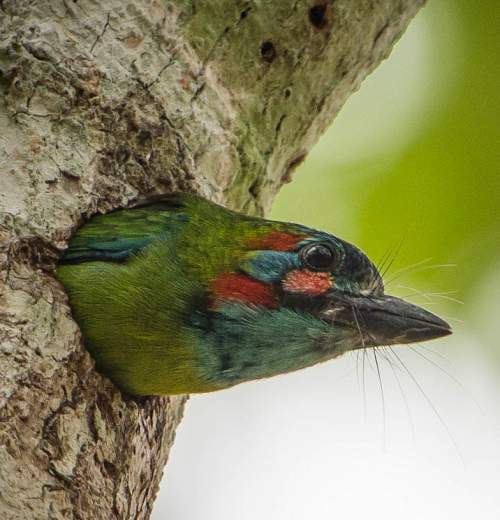 The blue-eared barbet (Psilopogon cyanotis) does not approached the thresholds for being Vulnerable either under the range size criterion, or under the population trend criterion, or under the population size criterion. The IUCN (International Union for Conservation of Nature) has categorized and evaluated the barbet species and has listed it as of "Least Concern". The CITES (Convention on International Trade in Endangered Species of Wild Fauna and Flora) status is ‘Not Evaluated’ for blue-eared barbet (Psilopogon cyanotis). The blue-eared barbet (Psilopogon cyanotis) is closely related to the Black-eared barbet (Psilopogon duvaucelii), Yellow-eared barbet (Psilopogon australis) and the Bornean barbet (Psilopogon eximius). The three recognized subspecies of blue-eared barbet (Psilopogon cyanotis) are: Psilopogon cyanotis cyanotis (Blyth, 1847), Psilopogon cyanotis stuarti (Robinson & Kloss, 1919) and Psilopogon cyanotis orientalis (Robinson, 1915). Current topic in Birds of India: Blue-eared barbet - Psilopogon cyanotis.